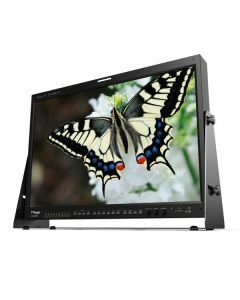 The 24" LUM-240G is a Ultra HD or 4Kresolution monitor with a native 3840x2160 10-bit LCD panel that can display full screen 4K video or 4 individual1920x1080 images. The 24" LUM-240G is a Ultra HD or 4Kresolution monitor with a native 3840x2160 10-bit LCD panel that can display full screen 4K video or 4 individual1920x1080 images. The LUM-240G is designed for high-end 4K cinema & UHD production. The LUM-240G can display UHD from a single 12GB SDI or HDMI-2 input or 4 3GB inputs. It offers the industry's most advanced features and video processing. The monitor covers the full DCI colour gamut & includes 3D LUT support.